3D imagery has now reached China's rice paddy fields. Farmers in the north-eastern Liaoning province, made use of different colours and varieties of rice saplings in order to mimic the 3D effect. The fields are housed as part of a theme park in Shenyang city, which also caters to weddings and camping trips for tourists. The Xibo farmers, an ethnic Chinese group, have an annual tradition of creating patterns on their rice paddy fields. Creating art on their rice fields also serves as a way of praying for blessings. Last year, they produced 13 images featuring different themes of places, animals, and people. Even the legendary Chinese deity Nezha was represented in rice paddy form. 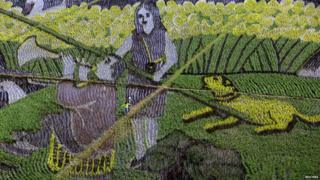 The murals set a 2012 world record for the "largest rice paddy work ever made". Officials are also hoping that this year's special 3D rice art will attract more tourists to Shenyang city. "Stunning work," remarked a Facebook user. "Crop circles are so last century." "It's Art Attack! In China," said another.